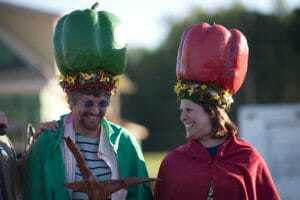 A central piece of The Amazing Pepper Festival is the crowning of the Pepper King and Queen every year. As a tribute to the artisans that spend their talents and passions, we wanted to capture the past 7 years of crowns. 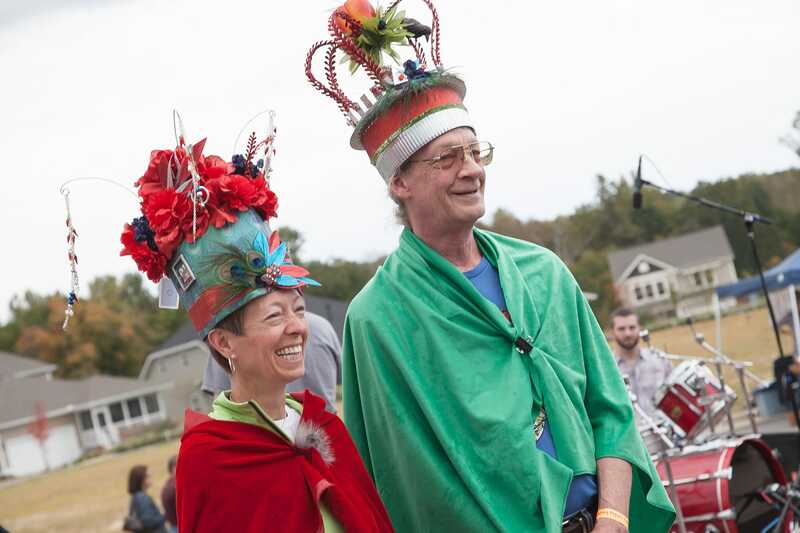 In 2010, year three of Pepper Festival, our collaborator Kristy Yule of Briar Chapel came up with the idea of a king and queen. What does the person have to do to become the great Pepper King and Queen we ask? Sell pepper tickets of course…pure crass commerce determines who is crowned…it is a fundraiser after all! We found Ashley Carter, proprietor of Goldbug Studios in Raleigh. Let’s just say that Ashley and Goldbug Studios were a perfect match for Abundance. Glitter was everywhere and the studio was full of magic. Ashley made the very first crowns and the King and Queen were Kristy Yule herself and John Battiste of Angelina’s Kitchen. They also had huge carafes of red wine and red capes. The Mayor of Pittsboro, Randy Voller crowned Kristy and John, thus beginning the tradition. The next year, we commissioned the Art Power couple, Janice Rieves and Joe Kenlan. Janice is a mosaic and glass artist among other talents and Joe is a renowned stone mason. 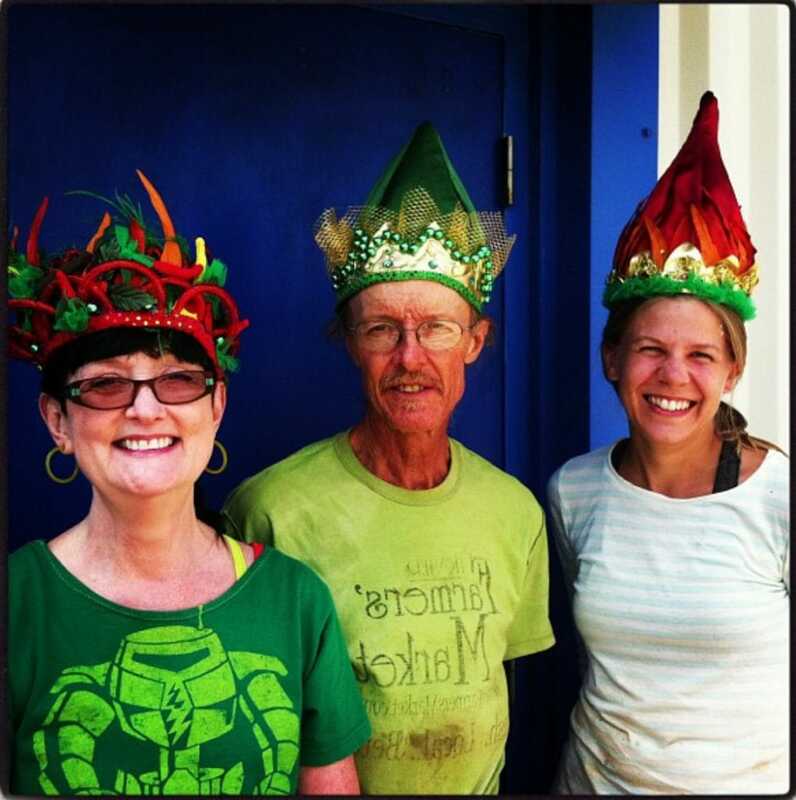 The two of them put their heads together and created huge paper mache peppers as the crowns. They were beautiful! And also a bit heavy…but we loved it. The 2011 King was Lyle Estill, of Piedmont Biofuels and a founder of Abundance. The Queen was Shannon McSwiney of Briar Chapel. Shannon was with child and made a perfect Pepper Queen. In 2012, Barb Yanik of Briar Chapel and John Battiste of Angelina’s Kitchen were the King and Queen. 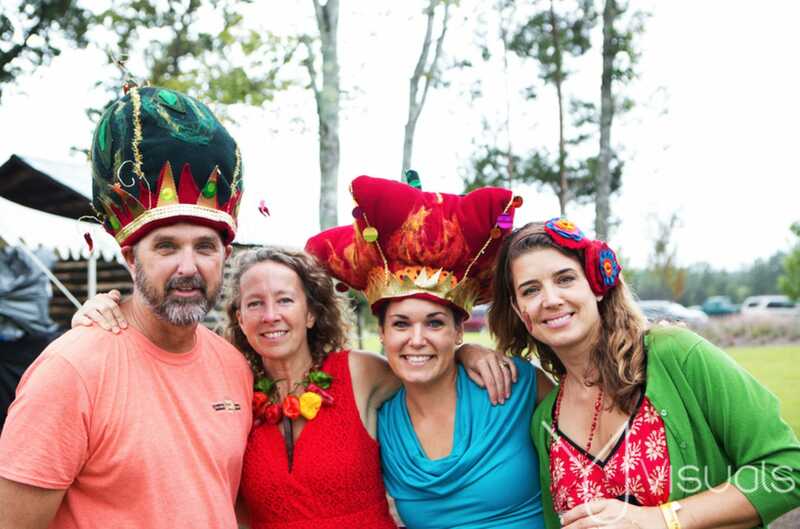 The crowns were made by a mystery artist and if you know who they are, please let us know and we’ll get you a couple of free pepper festival tickets! They did appear to be extremely uncomfortable! Royalty is not for the faint of heart! 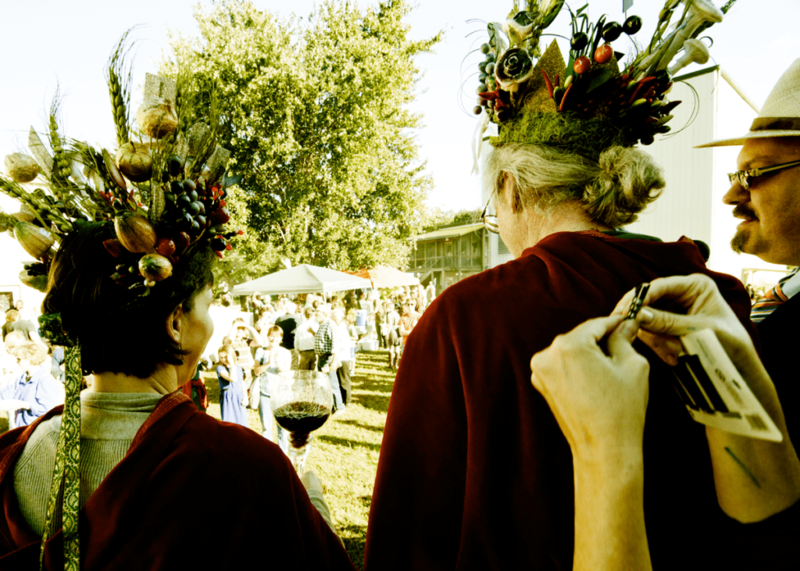 In 2013, Melody Eggen created the crowns. Melody has worked as the costume designer for the American Dance festival, Bates Dance Festival and numerous colleges and choreographers. Her crowns were soft and easy to wear. We loved them so much we asked her to do the next year also! Melody models with Farmer Doug Jones aka Dr. Pepper and intern, Emily. David Larsen and Erin Messier are royalty along with Tami Schwerin, Executive Director and Lyle Estill of Piedmont Biofuels. 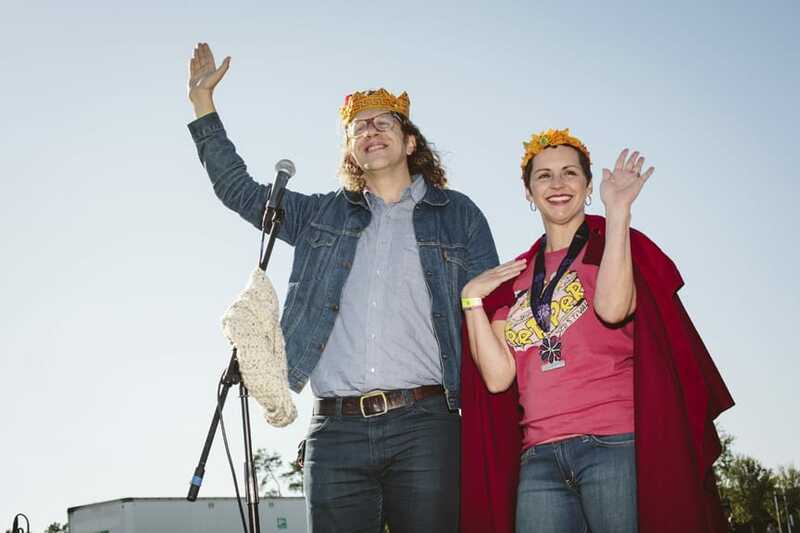 *These crowns were made by Melody Eggen and during the chaos of the festival, the king and queen went missing. We grabbed the headliner musician and Kristy Yule, Board President of Abundance to substitute and all was well. In 2015, Alisa Esposito joined the Abundance team as Creative Director and boy was she creative. 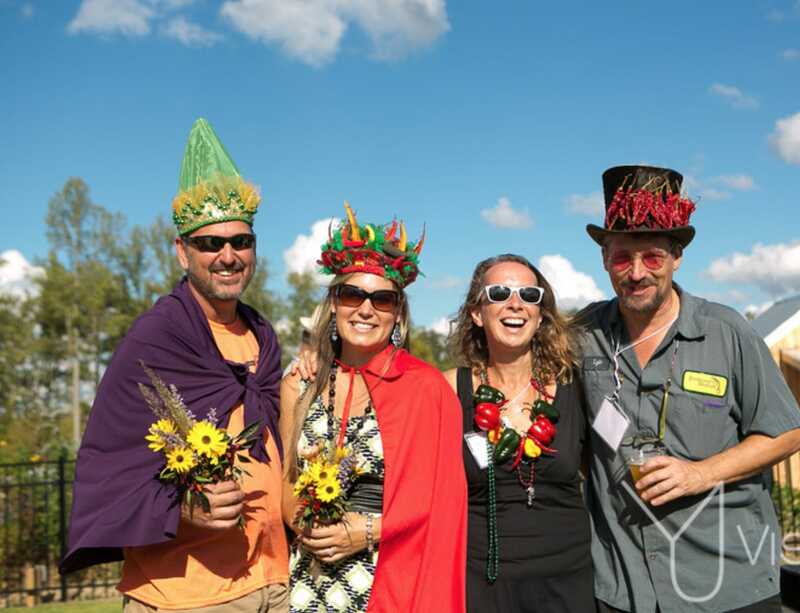 She made the crowns and some beautiful awards for the Chefs, Brewers & Distillers. These awards have become a distinguished honour given by celebrity food judges. The 2015 King and Queen were David Larsen and Erin Messier of David Weekly Homes, a Briar Chapel builder. Cherith Mangum and Jami Pearson. A big reason why Pepper Festival is so successful is Clairemont Communications and Briar Chapel. 2016 was the year of North Carolina’s HB2 “bathroom bill”. In solidarity, we crowned two Queens! Angelina of Angelina’s Kitchen and Barb Yanik of Briar Chapel. Both huge supporters of Abundance and the Pepper Festival. 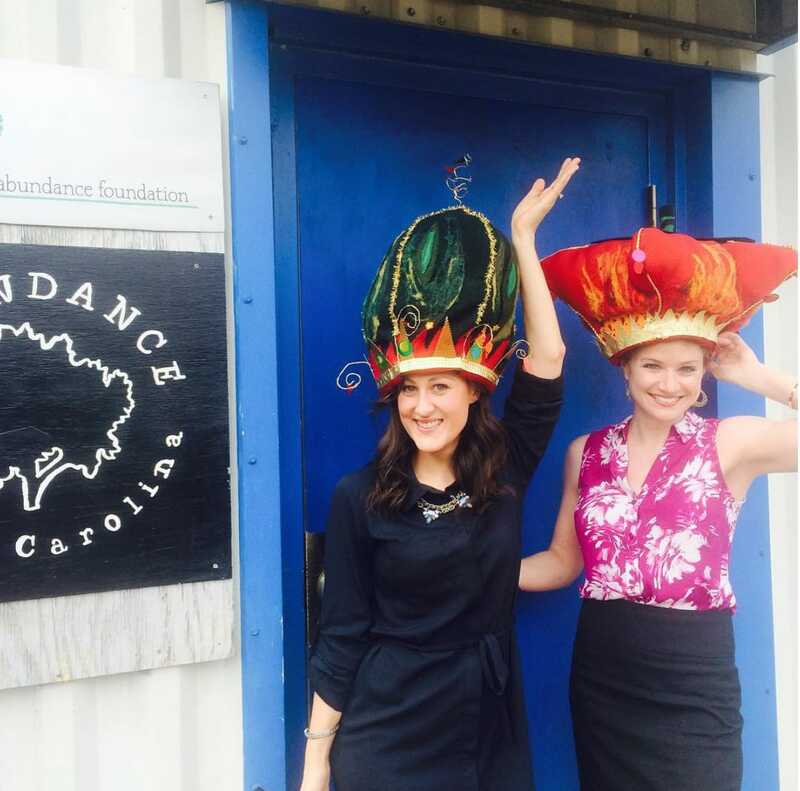 We also recycled the crowns made by Joe Kenlan and Janice Rieves. 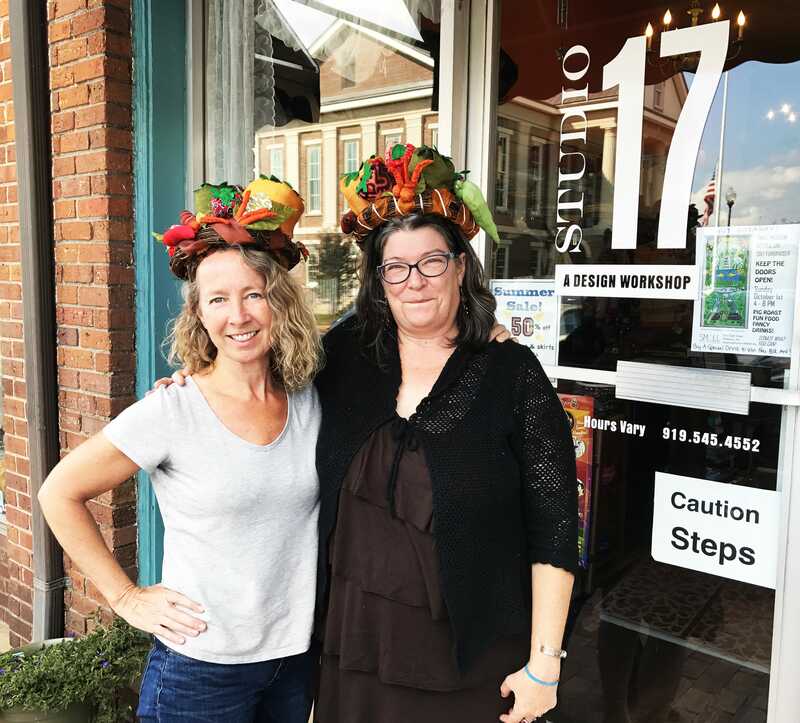 This year, our Crown Designer is Andrea Batsch of Studio 17 in downtown Pittsboro. Andrea makes all sorts of designs from men’s ties, saris and anything you bring her. She is a beautiful fabric artist and recycler. 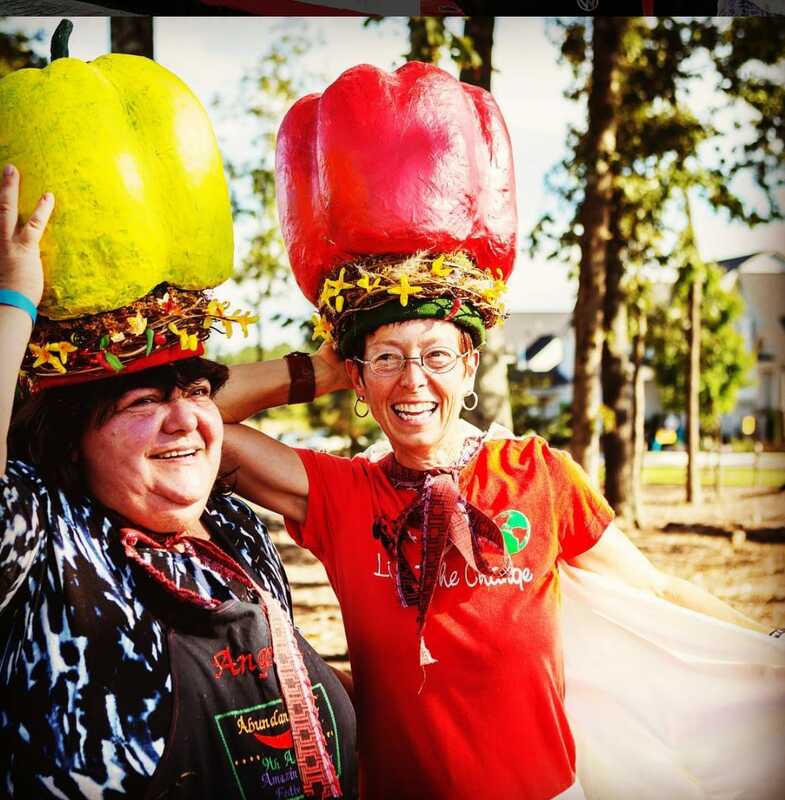 Who will be the King and Queen of the 10th Annual 2017 Pepper Festival? You’ll have to come out to see! Info, Chef, Brewers list, Music & Tickets are HERE!